We can solve even the most complex signage and wayfinding challenges. Knowing how to find one’s way in an unfamiliar place requires a type of communication a lot of people take for granted. The art and science of wayfinding encompasses all the visual cues that help you get where you’re going. We are experts at knowing what messages are needed at key decision points and how to combine visual elements to solve even the most complex signage and wayfinding challenges. To effectively guide people to their destination, it’s important to first understand how a person experiences a space. Before starting any project, we perform a site visit to familiarize ourselves with the location and understand the challenges that are unique to your project. Identifying lines of sight and traffic flow within an environment informs the design process. From the sign out on the street to the sign by your office door, we design signage to both inform people and reflect the personality of a brand within a space. Sign design must be appropriate to the architecture, fit within the budget and be easy to update and install. ADA signage has its own unique set of criteria. From the height of tactile characters to which side of a door to place a sign, complying with ADA requirements is critical to making spaces accessible to everyone. Our team stays up to date on the latest ADA compliance regulations to ensure the highest quality wayfinding materials for our clients. 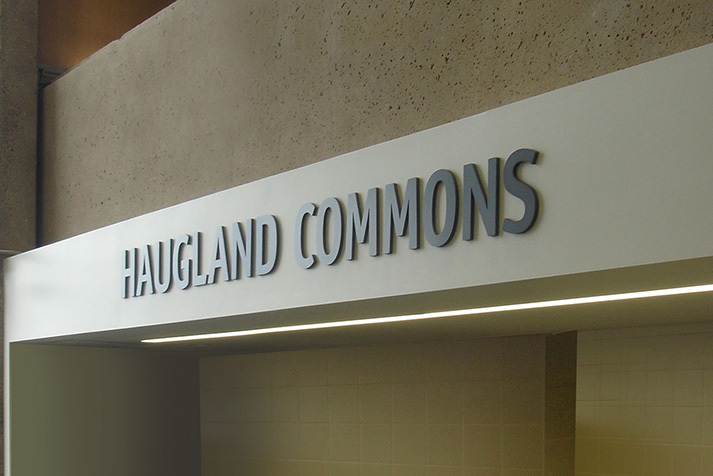 We are experienced in creating signage that complies with building codes for safety, security and legibility. Sign codes require specific placement, language and design to help make a space safe and secure. We are experts at sign fabrication and installation. We work in collaboration with our clients, vendors, architects and facility staff to make sure everything gets built and installed with professionalism and ease. Being a part of the entire wayfinding process allows us to ensure consistency among signage designs and that everything follows established sign design standards. 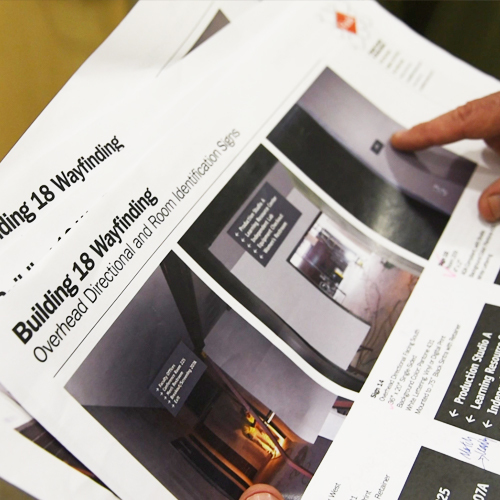 Let our team create signage for all of your wayfinding needs.